I bet you've heard of Christmas in July... well, why not snowflakes in July?! Maybe making a few quilled beauties will help you keep your cool if you happen to be roasting in your corner of the world the way we are in Delaware this week. Stephanie Sanchez is a fab snowflake designer who blends a great variety of shapes and looping techniques. Deb Mackes, another quiller of stunning snowflakes, treated us to pictures of her complex designs last December, as well as a simple pattern. I'm happy to say she's back today with a second little lovely. But before you get started, you might want to print out this grid that Stephanie has kindly posted on her website. 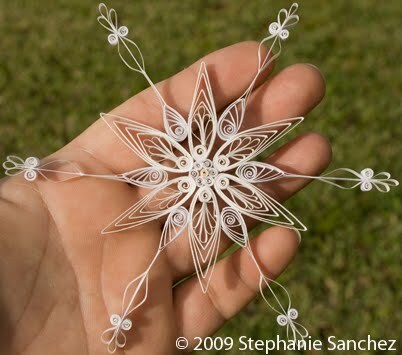 Trust me... as one who used to quill snowflakes without one, it will make lining up the shapes so much easier. Slide the grid under a sheet of clear plastic and get rolling! Use 1/8 inch wide white quilling strips. 1. Glue the 3 inch marquises evenly around the 2 inch tight coil. 2. Glue a V scroll in between each marquise. 4. Glue the 4 inch marquises to the tops of the V scrolls. 5. Glue a 1 inch tight coil to the base of each heart. Thank you for this.I tried making a snowflake like this sometime back.It was not bad but it was sure wonky.This grid idea is great. Thanks Sumi, yes, a grid is a huge help. Those are GORGEOUS! It is supposed to be 102 degrees here today. If I didn't have so many cherries to pit I'd definitely try making some of these today! Wow! These are really beautiful.. I love snowflakes! I love snowflakes. Wouldn't and entire Christmas Tree or the entire ceiling of a room be gorgeous all decorated with these delicate snowflakes! These are so pretty! must try them all. Now those are snowflakes that I don't mind seeing. Those are beautiful, I especially like that third one. These are delicate perfection! I am so sorry y'all have to experience the heat of the South where nary a snowflake lives! We had a bit of a "cool" spell where it only got to around 89, but we are back up to the 100's now! Maybe I should make some and hang them around my house to make me think it's cold?? lol! wowza those are so gorgeous! a quantum leap up from the old folded paper cut-out snowflakes of grade school. i love! Beautiful work as always!!! You are an unending source of inspiration!!! Ok Ok Ok! You finally found my Achilles heel!Snowflakes! How am I going to resist making one. Thank you for the tutorial and the grid tip. 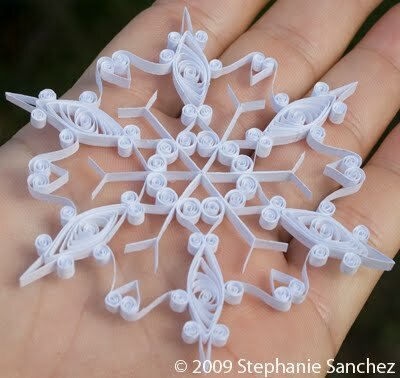 I bet I can talk Diane into reviving her quilling skills to make snowflakes with me. hi ann, i started on your recent snowflake post and ended up here!! i love both versions, but these ones are oh so delicate. i've bookmarked this for the next holiday season. thanks for always sharing and inspiring. just wanted to drop by and wish you a happy new year. hope it's been a good one so far! Hi Ana, thanks so much. 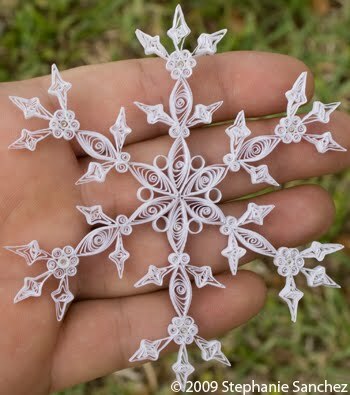 People always seem to love quilled snowflakes. I hope you'll try your hand at making them... start early in the season though, so they're relaxing and not stressful - that's my best advice! So,let it snow like this and be always happy as kids are!!! Thank you Aurelia, your quilling is fun and colorful - well done! If you're referring to things you saw on Stephanie's site, you might find her email address there and contact her directly. Usually if a coil has a center that pops out, it has been rolled unevenly. However that would be evident right away, not popping out only when it is ready to hang. Perhaps the coils have been exposed to high humidity or too much glue when assembled. Try rolling your coils more firmly so they have very small centers and perhaps use less glue. Hope this helps! Also happened to think to suggest fixing a popped out center by pushing against it with the head of a glass ball pin.